Your cupcakes win my heart because of that cardamoms and rosewater. Two my favorite ingredients. the cupcakes look great! I've never seen rice flour in cupcakes though... what does it do? 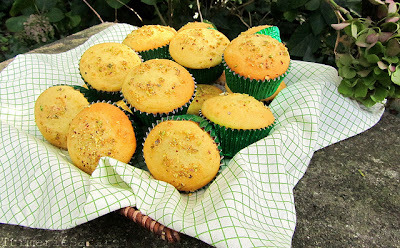 Anonymous, a small amount of rice flour improves the taste and texture of these cupcakes. 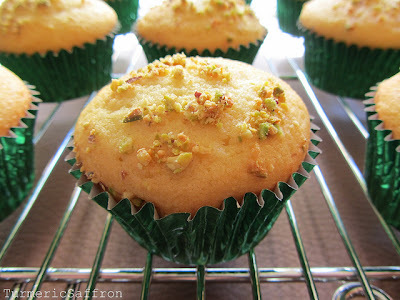 rosewater aroma, cardamom flavor and chopped pistachios - YUM! What a sweet story, Azita. Lovely cupcake photos, too. I've never had these; they look great. wow thats got some unique flavours, looks lovely! Beautiful. My mother used rosewater a lot in her cooking, Ihave yet to try. I just discovered your blog. I do sometimes try to cook Iranian food, even if I have nothing to do with Iran. These cakes have all my favourite flavours! and I like the lightness given by the rice flour! Will try them soon! Oh yum...we made these this morning and I'm surprised there's any left! Thanks Azita, this recipe will definitely be added to our sweets folder. I baked these two nights ago in two batches. One with and one without rice flour. The rice flour added a lot of spongy, airy lightness. My friends emptied that platter within 2 minutes. The one without rice flour was more like a pound cake. While delicious, the texture was visibly different. Sincerely, many thanks to you. Looking forward to more recipes, and sharing some in the future. The cakes sounds just delicious, and the photos are simply beautiful, Have not seen any architectural details like it. so I want to say thanks for your nice blog! Happy Birthday, dear Mahdi! Thank you so much! I had some friends from Iran who shared a recipie for a cake more than 20 years ago. i have lost the recipie and contact with my beautiful freinds. I loved that three layer cake that I used to make with a filling inside that was made of flour and butter and sugar I think and then once all the three layers would be stacked I would put the creamy topping on top and sprinkle bread crumbs. Has anyone heard of cake like this an if yes how would I be able to get a recipie gain. Anonymous, I don't recall any Iranian three layer cake recipe with sprinkled bread crumbs on top. I love your blog and I can't wait to make these for my Yazdi hubby :-) Thanks for sharing and creating an amazing blog that everyone else can benefit from!!! I've been waiting for something like this for ages. Thank you. You are so talented. I made these last night they turned out perfect! Azita thank you for this recipe! what is called in farsi though? like is it just "cakeh yazdi" or is there a specific farsi word for cake/cupcake that's used? It's just called cake yazdi. The word cake has become part of our language. Made this recipe last night. OMG, they taste great. very fluffy, moist and great aroma. Loved that there's no icing on them so could enjoy the flavors of the cake itself. Thanks for the recipe Azita. I tried this recipe and it was amazing. I made a few changes, i,e, put two teaspoon cardamon powder instead of 1/4 teaspoon and I did not use rice flour. It came out so yummy!! Thank you for such a great treat. Thank you so much for this recipe! My husband grew up eating this kind of cupcake in Iran and loves them. I've never had a real one, but as far as cupcakes go they're my new favorite. For those of you who haven't tried the recipe, do. 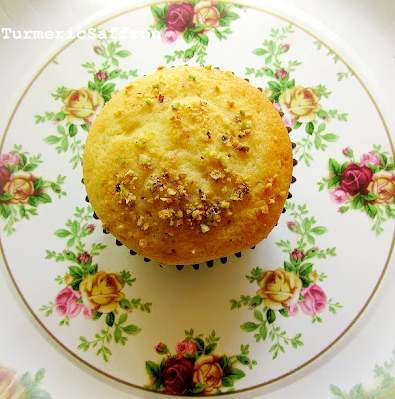 These cupcakes are simple to make, incredibly tender and perfectly sweet. I've tried both of the other cake yazdi recipes on the internet--one was tasty but really dense and the other had too much egg and not enough sugar (this recipe has more sugar and butter--it's just right). The other recipes also had annoying steps like whipping egg-whites or mixing the egg and sugar over hot water (a double boiler thing). If you make one batch of cake yazdi, make this one--and if you do, you'll make it again, guaranteed. They look great :) I love your blog! Am I able to bake this recipe as a cake rather than cupcakes? If so, should I change how long it's baked in the over for? I have never tried baking this recipe as a cake but most likely you will need to increase the baking time by at least 15-20 minutes. Thank you! You may need to turn down the heat to 325 F and bake the cupcakes in a pre-heated oven. Don't over bake them. My dad is from Yazd, and I always loved the original cake yazdi. This recipe unfortunately didn't have the same taste, but in general it was a good recipe. The cupcakes were so tender and good tasting. I made one batch of these last week and they were a huge hit with my colleagues (and my husband and me!) even without rosewater (kind of difficult to find here in Mexico City). This weekend I found rose essence and just took the latest batch out of the oven. I'll share them with my high school students tomorrow. They've been reading the book Persepolis by Marjane Satrapi so I've planned a small picnic of Yazdi cupcakes and tea as a special treat and a way for us to have a little taste of Persian culture. I am delighted to have found your blog and I look forward to trying some more of the recipes you have posted. I truly enjoy the stories you tell and the beautiful photos you take. Thank you for sharing your culture and recipes! Dear Heidi, thank you so much for your comment and your kind words. Thank you! My high schoolers loved the cupcakes! Good thing I saved one for my husband because there were not even crumbs left after my picnic with the students :) Thanks again for the recipe! Heidi, I'm so glad you made cupcakes and that they turned out well for you. It's so nice to know. Thank you! Was on a visit to Iran this past April/May and sampled these wonderful cakes. Since returning home, have been searching for the recipe. Finally found and tried them out a couple of times (without the rice flour though). They turned out just perfect! Will add on the rice flour and see. Azita, the hotel in Tehran served us some delicious semolina porridge for breakfast. It had a yellowish colour with lots of saffron and not too sweet. Would you have the recipe and what is it called? Was delicious! I don't think I've ever had semolina porridge for breakfast in Iran and I don't have a recipe for it. I'm so glad you tried this recipe and enjoyed it. Thank you. Oh my! Just finished making these tonight, and as soon as they were cool enough to touch, I just had to have a taste. I have never cooked with rosewater before, and that's why I really wanted to make these. I made as directed with no changes or substitutions. I so enjoy the flavor, not too sweet, and very light and airy. I don't even remember how I found this recipe, but I'm glad I did. Thanks so much for sharing. I will definitely be making these again. Yummy! I'm so happy to hear you enjoyed this recipe. Thank you! Sounds great! Looking forward to trying them. Do you know what I can substitute for the yogurt to make them dairy free? Hi Azita, should the sugar be granulated or caster? Hi Sangeetha, it should be granulated sugar. Hi, thanks so much for the recipe! I want to half the ingredients and I'm having a hard time figuring out how much butter to put exactly? Any help would be appreciated! Hi, about 5-6 tablespoons. Thanks.